The design of this load center allows the electronic breaker neutral wires inch pig tails" to be installed from the breaker side of the neutral bar, freeing up the Wiring gutter space. This feature provides a free and clear 4 inches of gutter space making installation quick and painless. Full length neutral bars on both sides of the load center offer flexibility in circuit placement. The electronic circuit breakers come complete with pre-trimmed neutral wires, eliminating installation steps. The neutral wire seamlessly slides into the neutral bar as the breaker is Being installed allowing for a secured bolted connection. The breaker features an inch oops loop" providing extra wire if needed in the event of over-torqueing. 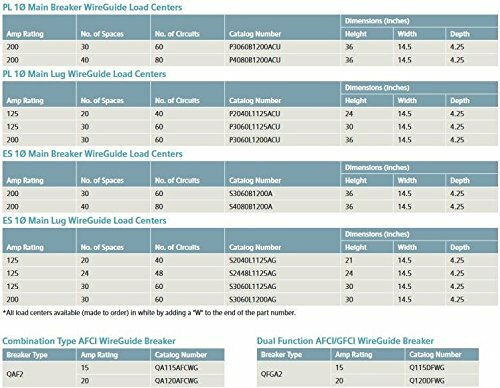 Upgrade your service to save time and effort with Siemens wire guide load center and circuit breakers. Other features of this load center include 1) Aluminum bus bars, 2) exclusive trim mounting tabs which allow the installer to hang the cover on the load center, freeing up both hands for installation, 3) exclusive Insta-Wire screws on neutral that reduce installation time by 25%, 4)) a pre-positioned bond screw which eliminates a bag, reduces risk of lost components, 5) 10 year warranty.